The continuing growth of global trade, resulted for container shipping in increased competition and a strategy of rationalization, consolidation and a development to optimize the economics of scale at the deep sea side. The outcome is an increasing deployment of ultra large container vessels. Ultimately, a successful operation of these big vessels will be determined by the way, the land side operation can meet the required scale of the deep sea side. The potential bottleneck for container shipping will therefore be the interface between the container terminal in the mega hub port and its hinterland transport network. In order to contribute to the aimed elimination of the described bottleneck, the mode of short haul feedering has been studied in a quantitative and qualitative way via literature review, interviews and a case study. 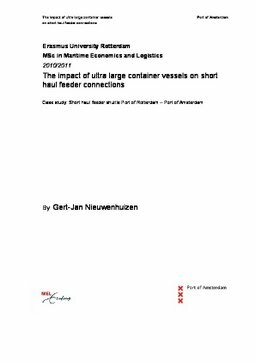 The case study focused on the interface between mega hub container terminals in the Port of Rotterdam and the hinterland transport network with intermediate hub terminals in the Port of Amsterdam. Analyzing the economical, logistical, sustainable and governance elements of short haul feedering, it can be concluded that cooperation in container shipping at the seaside, need to be followed by increasing cooperation, alliances and vertical integration in container logistics on the land side by shipping lines, terminal operators and shippers. This makes sense, as already for the main trades, container shipping is already increasingly perceived as a homogeneous good, paving the way to cooperation and collaboration among all actors involved in the supply chain. The approach of the supply chain on the level of total cost of ownership will result in rationalization and consolidation at the land side operations. The reached economies of scale for hinterland transport will contribute to meet the governments and citizens aim of decreasing congestion, pollution and environmental costs. The mode of short haul feedering has the potential to contribute to the realization of sustainable, reliable and cost effective corridors, supporting the efficiency and creating more capacity for the interface between the container terminal in the mega hub and its hinterland transport networks. Improving the required scale at the landside in order to match the sea side developments would ultimately lead to a competitive and resource efficient transport system of container shipping.